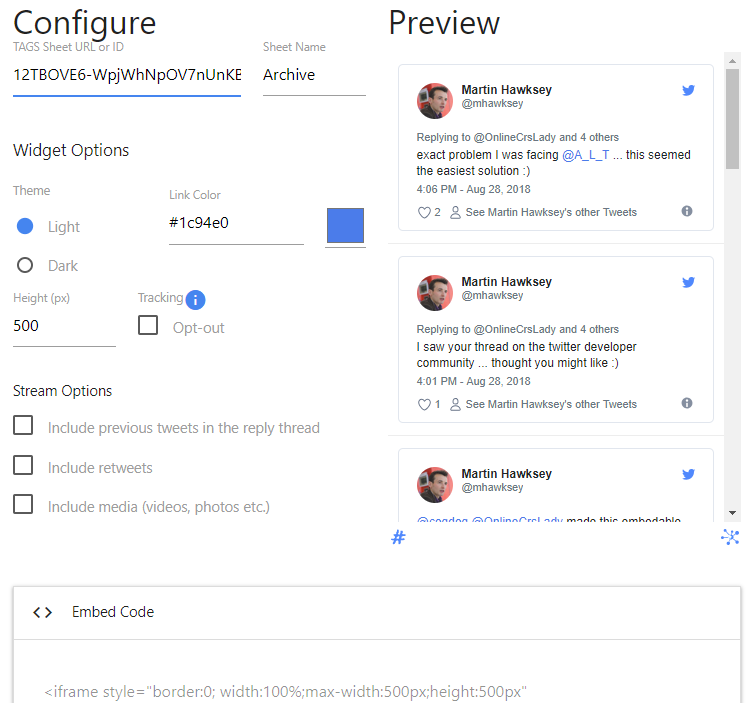 On 23 March 2018 Twitter announced that it was retiring search timeline widgets, suggesting people moved to a Curate a Collection of Tweets. For a lot of people, myself included, this is far from an ideal solution. Given the number of hashtag communities I’m part of I’d much prefer to set something up and let it run in the background. Note: Given TAGS defaults to updating every hour the widget content currently only updates when the page is refreshed. formatter.format(data, [c['from_user'], c['text'], c['time'], c['id_str']], c['text']); // Apply formatter and set the formatted value of the first column. If you are interested in exploring the source code I’ve posted it on Github and created a TAGS Widget forum to capture questions and discussion. Enjoy!